Hong Kong WinterFest, an annual event organised by Hong Kong Tourism Board, has for 2018 been renamed "Hong Kong Pulse Light Festival" and runs from 29th November 2018 until 1st January 2019, featuring a number of seasonal events during the Christmas and New Year period. IFC Mall in Central has one of many impressive festive season displays to be found in Hong Kong's major shopping malls and its 2018 offering is "Santa Academy"
A`classic sparkling Christmas tree will be on display at North Statue Square (adjacent to Mandarin Oriental Hotel) in Central from 29th November 2018 until 1st January 2019. 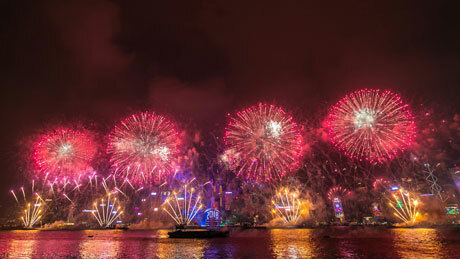 The main New Year’s countdown event, organised by Hong Kong Tourism Board. From 11pm, on 31st December 2018, at 15-minute intervals, “Shooting Stars”, short bursts of pyrotechnics are launched at 15-minute intervals from the rooftops of participating buildings. As the clock ticks down to midnight the spectacular 10-minute pyromusical show begins, starting on Victoria Harbour, followed by displays launched from the harbour, Hong Kong Convention & Exhibition Centre (HKCEC) in Wan Chai, and nearby buildings. "Shooting Stars" will be launched every 15 minutes from 11pm onwards from the rooftops of six participating buildings on Hong Kong Island. The shooting stars represent god wishes for happiness, health, fortune and wealth. Victoria Harbour, aboard one of the New Year countdown cruises organised by the local travel trade (Boats, however, will not be allowed to enter the pyrotechnics launching area during the display. Central Victoria Harbour will be closed to marine traffic from 11pm on 31 December 2018 to about 1am on 1 January 2019. The landing steps at Kowloon Public Pier will be closed from 9:30pm on 31 December 2018 to about 2am on 1 January 2019). TVB Jade will broadcast the whole event live in Hong Kong. Hong Kong Tourism Board will broadcast the event live via satellite to major media organisations around the world and arrange live broadcasts on social media and video platforms. SPECIAL TRAFFIC AND CROWD CONTROL MEASURES - Visitors should note that extensive road closures and crowd control measures will be put in place in the Central, Tsim Sha Tsui and Wan Chai districts area from 6pm, 8pm and 9pm onwards. Further details to be advised. Christmas Sensation runs from 15th December 2018 to 1st January 2019 and features the Park's first-ever special collaboration with Hong Kong's iconic cartoon character McDull. The two "Made in Hong Kong" brands will present Hong Kong's first McDull music theatre show "McDull - Fishball On The Run" at Applause Pavilion featuring McDull and Mrs Mak. Waterfront Plaza becomes a festive Christmas village and as night falls, there will be a daily “Light Up the Night” ceremony at the 40-foot tall Christmas tree, which will include a choir performance every night. The Waterfront Plaza will also feature “Santa's Cottage” where families can snap a seasonal photo with Santa Claus. Hong Kong Disneyland’s “A Disney Christmas” runs from 15th November 2018 to 1st January 2019. Opening hours areand highlights include “Mickey and Friends Christmastime Ball”, a seasonal musical extravaganza, “A Magical Twilight Snowfall”, “A Holiday Wish-Come-True” Tree Lighting Ceremony”, and “Fantasy Gardens Wintertime Market”. 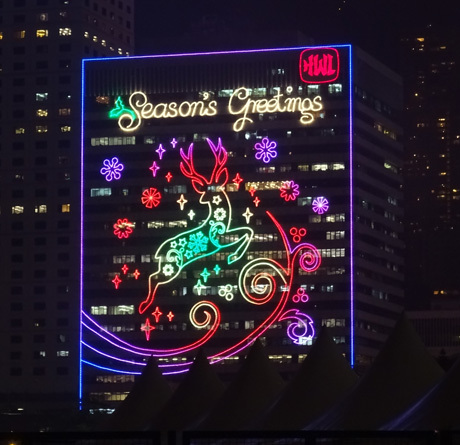 Hong Kong Pulse 3D Light Show was a new event organised by Hong Kong Tourism Board (HKTB) in 2014 which is has been shown four times each evening during three time periods to enhance the festive ambience of three HKTB mega events including Hong Kong WinterFest. Produced by Spinifex Group, a prestigious Australian overseas production team, the spectacle has in previous years been created by images projected on to the façade of Hong Kong Cultural Centre and Clock Tower and is based on the theme of Hong Kong as a vibrant, cosmopolitan city, and shows how it evolved through the years into the major world city it is today through striking visuals, including uniquely local buildings. Spinifex Group’s Head of Creative, Richard Lindsay, has over 20 years’ experience in the design industry and has been involved in numerous international creative media shows, including the opening ceremony of the Beijing Olympics in 2008, in which he collaborated with famed Chinese film director Zhang Yimou; the 2010 Shanghai World Expo; the 2010Vancouver Winter Olympics; and the 2013 edition of the Sydney Opera House light show in “Vivid Sydney”. Illumination of the light installations is from 7-45pm to 11pm on 29th November and 5pm to 11pm from 30th November 2018 until 24th February 2019. Visitors will be able to watch snowfall at Ngong Ping Village at certain times daily between 1st December 2018 and 1st January 2019. A specially decorated cable car installation is being set up at Ngong Ping to enhance the festivity. Snowfall effects will take place at scheduled times in Ngong Ping Village Square and the Bodhi Tree. Each snowfall session will last about 20 minutes on Mondays to Fridays at 11-30, 12-45 and 14-30 and 16-00 and on Saturdays, Sundays and public holidays at 11-30, 12-45, 14-30 15-30 and 16-30. There will also be performances of Christmas carols at Ngong Ping Village with snowflakes and music in the air on specified dates and times (to be advised). Decorated cable car installation at Ngong Ping Village at the 2018 "Snowy Christmas at Ngong Ping 360"
The AIA Great European Carnival, which made its debut in Hong Kong in 2015 and again operated in winter 2016 and 2017 returns for the Christmas and Chinese New Year period from 14th December 2018 until 17th February 2019 (except Friday 11th January 2019). 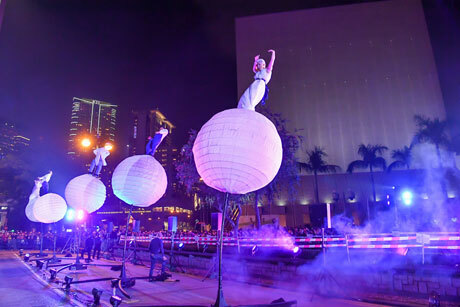 The event, which takes place on Central Waterfront Event Space, adjacent to the Hong Kong Observation Wheel, features circus, traditional carnival rides, games, entertainment, attractions and special events. Major shopping malls all feature attractive Christmas decorations, starting from about mid-November - early December and lasting throughout the Christmas and New Year period. Some of the best include Harbour City and 1881 Heritage at Tsim Sha Tsui, Times Square and Hysan Place in Causeway Bay, IFC Mall in Central, Festival Walk at Kowloon Tong, Elements Mall at ICC (International Commerce Centre) above Kowloon Station in West Kowloon and in the New Territories, Citywalk at Tsuen Wan and New Town Plaza, Sha Tin. Many buildings facing the harbour in Central and Sheung Wan on Hong Kong Island and East Tsim Sha Tsui and Canton Road, Tsim Sha Tsui in Kowloon are illuminated with Christmas displays. From 21st to 27th December 2016 the ICC Light and Music Show will feature a Christmas light show and on 31st December there will be a special New Year’s countdown animation. Synchronized music is broadcast on the P3 and P4 Terraces of IFC Mall in Central and the music accompanying the show can also be heard by downloading the ICC Light and Music Show smartphone app. The show takes place nightly at 7-45pm and 9pm. The ICC Light and Music Show premiered on 25th April 2013 and has been recognised with a Guinness World Record certificate for largest light and sound show on a single building. The show combines music and story in light on two façades of International Commerce Centre (ICC) facing the harbour totalling 50,000 square metres. The towering 118-floor ICC, Hong Kong's tallest building at 490-metres, posed a challenge with its height and width in creating and projecting highly-detailed graphics. The show is the brainchild of Hirohito Totsune, renowned Japanese lighting designer with achievements recognized by a leading international lighting design association, including the Tokyo Skytree lighting. For the initial show Hirohuto Totsune and his team created almost a thousand sketches for the animation that filled the ICC façades through a programme controlling each LED at 30 frames per second resulting in a breakthrough in beautifully rendered animation that surpasses traditional lighting design. All MTR lines except the Disneyland Resort Line, Airport Express Line and East Rail Line between Sheung Shui and Lo Wu / Lok Ma Chau will operate overnight on Christmas Eve and New Year's Eve. Hong Kong Tramways tram services operating hours on New Year's Eve will be extended until 3am the following day. All post offices will be closed on December 25th and 26th except for the General Post Office at Connaught Place, Central which will open from noon to 5pm and the Airport Post Office which will open from 8am to 5pm. General postal services will be provided. Details of services available will be advertised at the respective post offices. There will be no mail delivery on 25th and 26th December. One mail collection will be made for the posting boxes of the General Post Office and the Airport Post Office. All post offices will be closed on 1st January except for the General Post Office at Connaught Place, Central, Tsim Sha Tsui Post Office at Middle Road, Tsuen Wan Post Office, Sha Tin Central Post Office, Tuen Mun Central Post Office and the Airport Post Office. The General Post Office will open from 9am to 5pm, Tsim Sha Tsui Post Office, Tsuen Wan Post Office, Sha Tin Central Post Office and Tuen Mun Central Post Office will open from 9am to 1pm. Normal business hours of 8am to 5pm will be maintained by the Airport Post Office. General postal services will be provided. Details of services available will be advertised at the respective post offices. There will be no mail delivery on 1st January. One mail collection will be made for the posting boxes of the above six post offices. Hong Kong public libraries, including Hong Kong Central Library and the mobile libraries, will be closed at 5pm on Christmas Eve and New Year's Eve and will be closed on Christmas Day, Boxing Day (Dec 26th) and New Year's Day. 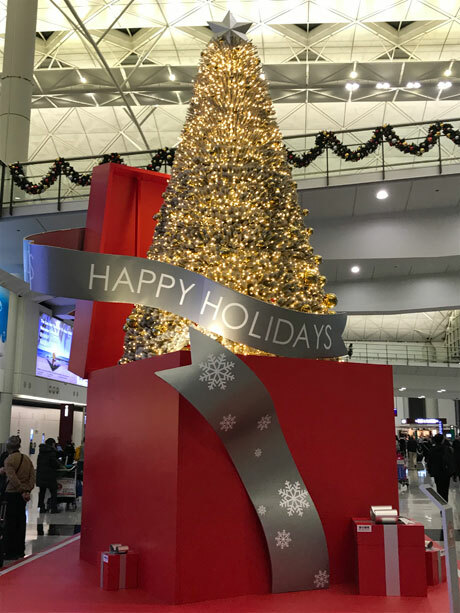 The Hong Kong Immigration Department estimates that around 13.49 million passengers (including Hong Kong residents and visitors) will pass through Hong Kong's sea, land and air control points during the Christmas and New Year festive periods (from 21st to 26th December 2018 and 29th December 2018 to 3rd January 2019). Among them, about 77%, or around 10.39 million passengers, will pass through land boundary control points. The number of outbound passengers will be at its highest on 22nd December (Saturday) with over 620,000 passengers departing Hong Kong, while the number of inbound passengers using land boundary control points will reach its peak on 26th December (Wednesday) with around 542,000 passengers arriving in Hong Kong. Lo Wu will be the busiest control point, and it is estimated that there will be around 3.30 million passengers, with a daily average of about 275,000 passengers, travelling via this control point during the festive period. The passenger traffic at the Lok Ma Chau Spur Line and Shenzhen Bay control points will also be heavy, with daily average forecasts of about 169,000 and 139,000 passengers respectively. To cope with the anticipated heavy traffic during the festive period, the Immigration Department has redeployed additional staff to reinforce various control points and has minimised leave for front-line officers for flexible deployment and operation of extra clearance counters and kiosks. Additional security guards will also be deployed to provide crowd management support. Furthermore, the Immigration Department, the Police, the Customs and Excise Department and the MTR Corporation Limited will set up a joint command centre at Lo Wu Control Point to make necessary arrangements. The Immigration Department will also establish close communication with the Mainland frontier inspection authorities. To ensure smooth passenger traffic flow, passenger conditions will be closely monitored and appropriate traffic diversion plans will be adopted when necessary. The Immigration Department will upload daily passenger statistics for the above festive period to its website for public reference. For travellers making journeys to the Mainland, the Immigration Department reminds them to carry their proof of identity and valid travel documents for crossing the boundary. Hong Kong residents should also check the validity of their Home Visit Permits. Non-permanent residents must carry their valid smart identity card as well as their Document of Identity for Visa Purposes or valid travel document.